The main function of the flywheel on a Briggs & Stratton engine, as on any small gasoline engine, is to maintain crankshaft momentum between piston strokes, but it also performs other functions. It cools the engine, and it energizes the ignition coil to fire the plug on each revolution. The flywheel has a small metal part, called a key, that keeps it in the proper orientation on the crankshaft to perform this last function. The key can shear when the mower hits a rock or other foreign obstacle, causing the mower to stall and misfire. Replacing the key is a relatively straightforward task. Turn off the lawnmower and let it cool down for 10 minutes or so. Set it on a flat surface and pull the wire off the spark plug to prevent an accidental start-up. Unscrew the bolts holding the engine housing cover, using a socket wrench. The location of the screws depends on the lawnmower model. 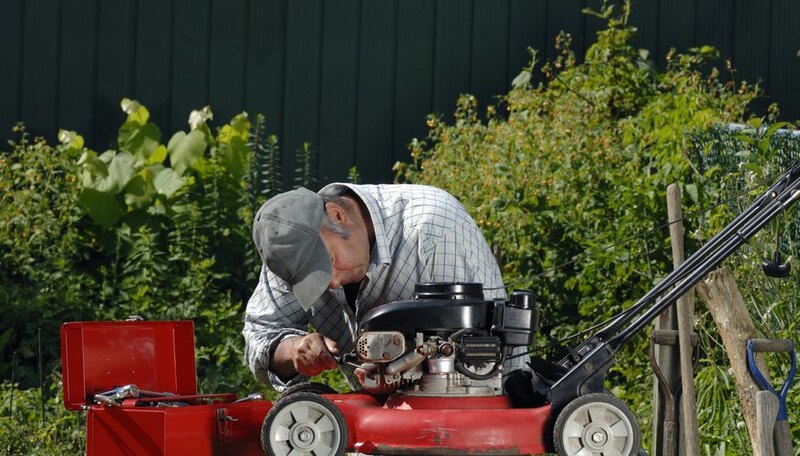 Briggs & Stratton supplies engines to many lawnmower manufacturers, but there usually are three or four bolts. One may be hidden on the side of the housing near or underneath the gas tank. Unscrew and remove the recoil starter assembly. One of the bolts holding the assembly to the engine also may be holding the gas tank. If so, move the gas tank aside -- you shouldn't have to disconnect the fuel line. Keep the gas tank upright to avoid spilling fuel; if the tank is full, you may have to siphon some fuel into an approved container to avoid spillage. Unscrew the single nut holding the flywheel to the engine crankshaft. Wrap a strap wrench around the flywheel to hold it steady and safely without damaging it. Secure the wrench and then unscrew the nut with a socket wrench by turning it counterclockwise. Lift off the flywheel using a flywheel removal tool. This tool attaches to the two threaded holes on the hub of the flywheel, breaks the flywheel loose when you tighten the central stem against the crankshaft. Once the flywheel is loose, then lift it off. Remove the damaged key from its slot on the side of the crankshaft. It's a small piece of metal about an inch long and 1/4 inch wide; it should slip right out. Replace it with a new key. Slip the flywheel back onto the crankshaft, tighten the strap wrench around it and turn the nut clockwise to tighten it. Reattach the recoil starter assembly, engine cover and any other parts you removed. Reattach the spark plug wire before you try to start the engine. If your flywheel doesn't have threaded holes, you can't use a flywheel remover. In that case, screw the nut loosely back onto the crankshaft, wedge a screwdriver under the flywheel and give the shaft a sharp tap with a hammer. This should loosen the flywheel so that you can lift it off. The flywheel is fragile, and if you dent or distort it in any way, you must replace it. Avoid hitting it with a hammer or holding it with pliers.